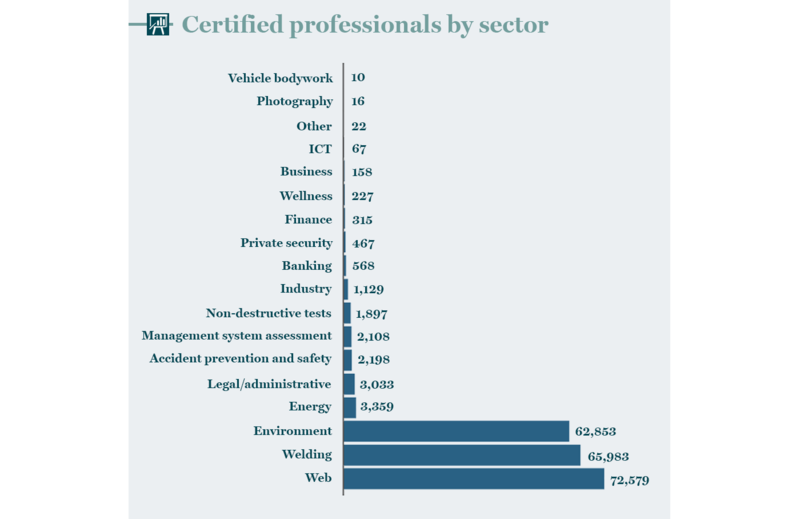 With the liberalization of the market of professionals and the birth of new professional activities, the accredited certification of professionals has taken on a strategic role for the protection of the public and to guarantee the quality of performances. There are about 5 million registered professionals in Italy which make up 15% of national GDP. Over 2 million 300 thousand are the so-called “regulated” professionals, organized in trade associations and professional orders. In order to be registered into trade associations and other collective groupings, a specific qualification is generally required, together with the holding of a period of apprenticeship, the passing of a state examination and, for some professions, the possession of a qualifying degree. To maintain registration it is necessary to attend certain professional refresher courses every year. New professions are constantly being “invented” in Italy to keep abreast of the times and of technological innovations: there are more than 3 million “unorganized” professionals in orders or colleges, operating in sectors of activity not included in those provided for by the regulated registers. These are professions born because of market needs as a result of technological, social, economic and cultural transformations, such as management consultants, trainers, logisticians, IT specialists, management system auditors, naturopaths, kinesiologists, massage therapists, graphic designers, advertisers, condominium administrators and real estate appraisers, wedding planners, e-reputation managers and digital copywriters, security managers and many others. It is a dynamic, constantly evolving world, not subject to law: there are no specific qualifications or state exams, but all of this is entrusted to the initiative of the individual professional or industry associations, regarding the acquisition of specific skills and customer satisfaction (organizations or individuals) that determine the success or failure of the professional. Professionals aim to turn their knowledge and skills into performances for consumers and companies. Well trained and competent professionals need to be protected by unqualified competition from improvised professionals, offering the market the objective verification of the skills actually held. Customers, in order to rely on a professional, need to have a form of “preventive guarantee” in order to obtain adequate services for their needs and to be protected from the risk of facing problems or incurring, in the worst case scenario, in the damage. While for the “regulated” professions, the system of professional orders / colleges guarantees a certain level of surveillance to protect customers, as they ensure the acquisition of the competence and professional updating of their members, for the other professions there are no law obligations. At the end of the 90s an antitrust survey highlighted the need to liberalize the professional market – a position which is in line with EU standards – and to find more effective methods of protecting consumers, ensuring performance quality and respect for ethical principles and codes of behaviour. In response to solicitation from the EU and to the evolution of the work market, with Law 4/2013 “Dispositions concerning non-regulated professions”, the Legislator has created a new normative framework promoting voluntary self-regulation of professionals, respecting the principles of free performance of professions, based on autonomy, competence and independence of intellectual and technical professional judgement. This law does not prevent individuals from carrying out professional activities but makes the market know, through UNI technical standards, what skills must be possessed by professionals and the forms of guarantee of their professionalism.